Cerebral Palsy of Ulster County is celebrating more than 65 years of helping people with disabilities beyond Cerebral Palsy in eight counties. Normann Staffing is proud to support the organization with its urgent personnel needs. Tammy Paquette, recruitment manager for The Arc. 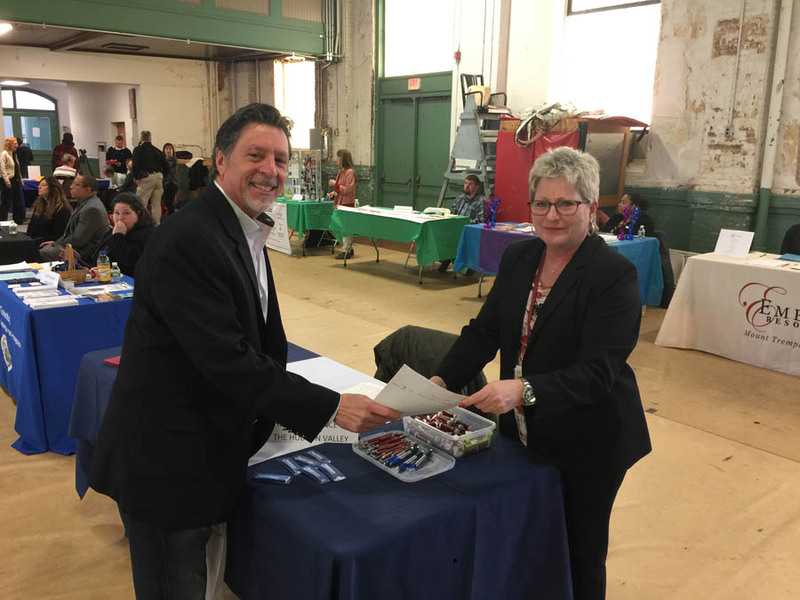 Ulster-Greene, New York and Tony Marmo, president and owner of Normann Staffing at a recent job fair for youth in Ulster County. The nonprofit Arc of Ulster-Greene supports 1,300 people with disabilities and gives them opportunities to experience full lives. Saluting our Client of the Month: Health Alliance, Westchester Medical Center Health Network, a long-term client for both office and healthcare personnel. 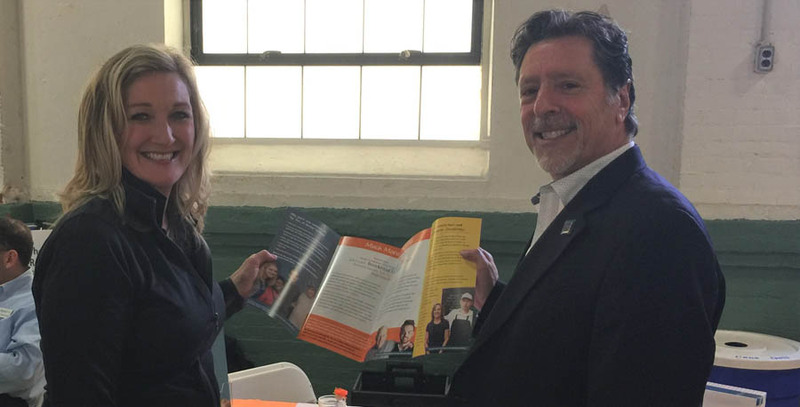 Tony Marmo, president of Normann Staffing and Marianne Salerno, director of recruitment & retention, human resources. 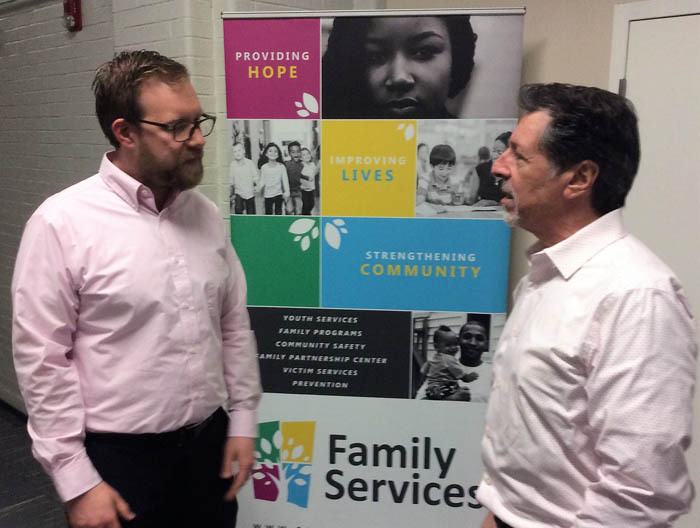 Chris Pels, director of human resources and risk management for Family Services, and Tony Marmo, president of Normann Staffing, at the Family Partnership Center in Poughkeepsie discussing the April 26 Family of the Year Awards Dinner. We’ll be there! Shown above, Ulster Community College President Dr. Alan P. Roberts and Normann Staffing President Tony Marmo with Milly Slater, one of the staffing agency employees at the college. Normann Staffing has been providing temporary full- and part-time workers since 2001. In a new feature making its debut this issue, we’re saluting clients that we’re proud to support. We were delighted to welcome James F. Davenport, president and chief executive officer of the 149-year-old community bank, at Normann Staffing headquarters in Kingston.